‘Behold! Your World Now Burns’, the sole track from Bludy Gyres, represents a full seventeen minutes of extreme doom, dirge and sludge. Helmed by Atlanta metal legend Tommy Stewart (formerly of Hallows Eve, also of doom band Negative Wall), the track opens with feedback, branches out into distortion and then after a full two minutes morphs into a riff that’s so sludgy and slow, it barely qualifies as a riff at all; it’s much closer to minimalist noise. For the next minute and a half, the noise wavers, suggesting that something might happen, but it never quite does. Eventually, a solid doom metal riff cranks through and it sounds like the result of the most extreme Melvins blended with the outright heaviness of the UK’s Kurokuma. The guitars are downtuned about as far as humanly possible; chugging, chugging, occasionally hovering towards a string bent tone that sounds like an uber-heavy version of Black Sabbath’s ‘Iron Man’. Although it takes forever and a day to find its feet, by the time a few wordless vocal sounds drop in for extra spookiness, in doom terms, this track sounds superb. Luckily, when the lead vocal finally arrives – at about the point where most standard tracks might think about ending – the quality continues, since the featured voice is of the clean variety, which is much easier to take than the growling traits that are usually encouraged by such ferocity. With the riffs continuing to mix bits of traditional, very slow doom with multi-layered Sabbath-isms played at half speed, genre-wise there’s so much to like. …And then, at seven minutes, everything stops dead. With a brief interlude featuring the higher registers of a solo bass, the track then becomes more about pure atmospheres than riffs or music, until the appearance of a new and even sludgier riff two minutes later. With the arrival of a second musical movement, Bludy Gyres prove that they’re not just about the heavy… They’re also about the even heavier. With that, several bars’ worth of slow, grinding and spacious riffs take hold until, eventually, the heavy chug is churned into a pounding groove. Ugly, demonic, intense…and yet oddly bluesy, this at least gives the huge number a bigger sense of focus, even if the results aren’t going to appeal to anyone bar the most doom obsessed. To finish, the original riff reappears to close everything with a selection of doom oriented metal that, in the hands of anyone a little more concerned with any kind of accessibilty, would have made a fine number alone. 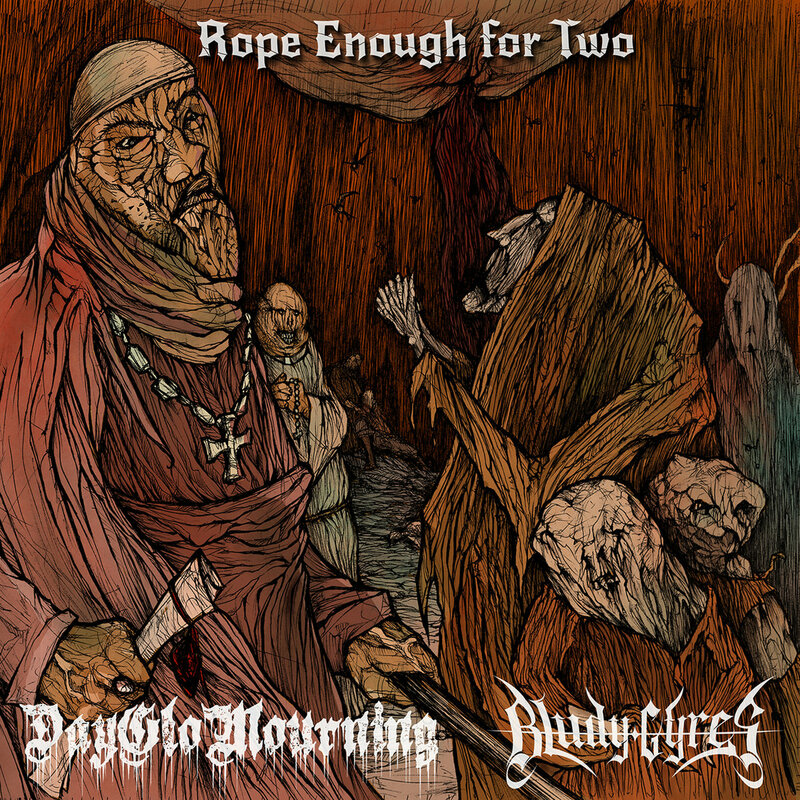 More accessible due to track lengths but by no means less heavy, Dayglo Mourning make their studio debut here in style, with three numbers that mix great riffs with more of a “classic” doom sound. ‘Wizard In White’, especially, finds a place as a stand out track, purely for a riff that pulls influence from Electric Wizard, then adds a little extra fuzz for good measure. Guitarist Joe Mills has a superb tone throughout and so obviously thinks nothing of using a repetitive style for maximum impact. When speeding up a little, Dayglo Mourning go from good to great, showing that the trio line-up is particularly effective when working a tight groove. The rough vocals are the weak link, but as with so many metal bands of this style, it’s easy to look past their rough edges and allow the riffs to work their magic. The instrumental ‘Weedcreeper’ shows off a much slower side to the band – more in keeping with Bludy Gyres – as for the most part, slow and distorted guitar sounds drift across several bars at a time. Upon reaching more of a melody, the doom fuses itself to an almost Southern groove metal riff, allowing drummer Ray Miner to throw out a very rhythmic spine, which again really works to the power trio’s advantage. Finally, ‘Dark Ritual’ ends Dayglo’s recorded debut with some traditional sludge, sounding like a cross between Brisbane’s Lizzard Wizzard, Kurokuma and Goatsnake. It doesn’t push any boundaries for the band or the style, but in terms of riffs and something like a half-accessible heaviness, there’s a lot to enjoy. In fact, in terms of overall enjoyment – vocals aside – the far less experienced Dayglo Mourning have Bludy Gyres beaten at almost every turn. Ignore the frankly crappy artwork, it’s the music that really counts…and in terms of riffs, these two bands and four tracks dish out more sludgy sounds than most bands could deliver across twice as much material in a more conventional format. 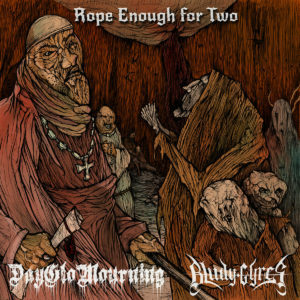 It’s never easy going, but for lovers of Conan, Kurokuma and the far more intense breed of sludgers, ‘Rope Enough For Two’ should more than appeal. This entry was posted in Album & EP Reviews and tagged atlanta, bludy gyres, dayglo mourning, doom metal, metal, sludge metal, tommy stewart by Real Gone. Bookmark the permalink.